Three hundred years has passed since the Last War. That's how the Elites called the third worldwide conflict, swearing that their rule would ensure that humanity would stay at peace forever. They lied. After the war, two thirds of women were born barren, so the fertile ones have a duty to society they must fulfill by either giving birth to a child by their 25th year, or go through the Auctions. Xander spends most of his time in his lab, but once a year, he has no choice: every unattached, childless male in the City is bidden to attend the Auctions, even the very first genetically engineered soldier they now call Elite. He never had any intentions to bid on a woman; children weren't on his radar, and if they had been, he wouldn't have needed the ridiculous farce his party intended to abolish as soon as they were elected. Then, he sees her. Ruby Ruth Sterling. The woman for whom he would destroy the world. Till Dawn Do Us Part is a novella, part of a series. Expect a cliffhanger. 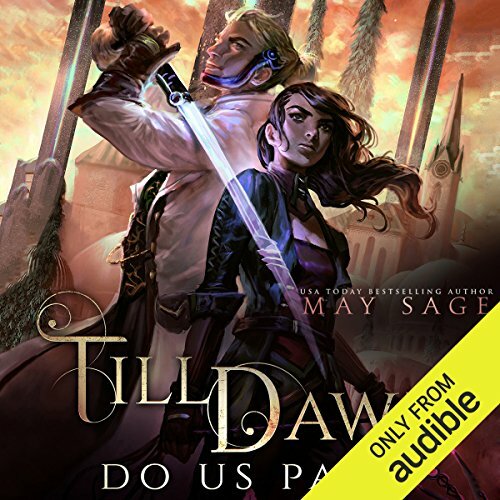 ©2017 May Sage (P)2017 Audible, Inc.